Over thirty divers drove and flew from as far South as Victoria, and as far North as Cairns, to compete in the 2012 1770 Classic on July 14. 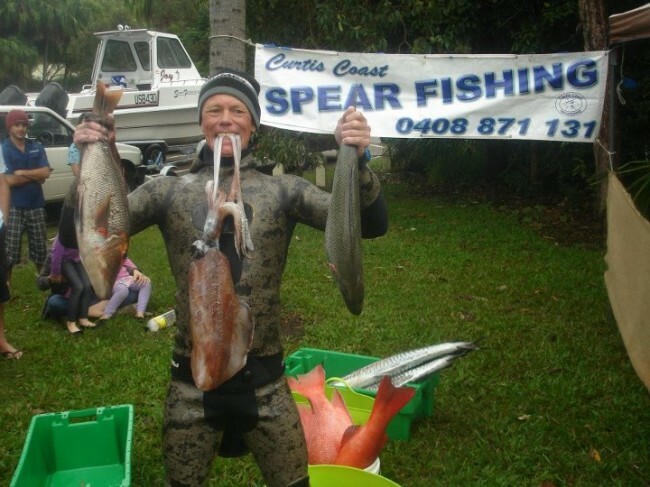 For the past two years, the 1770 Classic has been one of Australia's largest spearfishing competitions. Hosted by the Curtis Coast Spearfishing Club (CCSC), the unique format of the competition has received widespread praise for its strong emphasis on selective, sustainable spearfishing. CCSC’s 1770 Classic is a competition that focuses on quality, rather than quantity. Competitors are allowed to weigh in 3 fish from the species list, and scores are based on the percentage weight of those species when compared to the target weights set by the club. The closer a divers fish is to the target weight, the more points they receive. Being allowed to weigh in just 3 quality fish for the day makes this an extremely selective, but challenging competition. 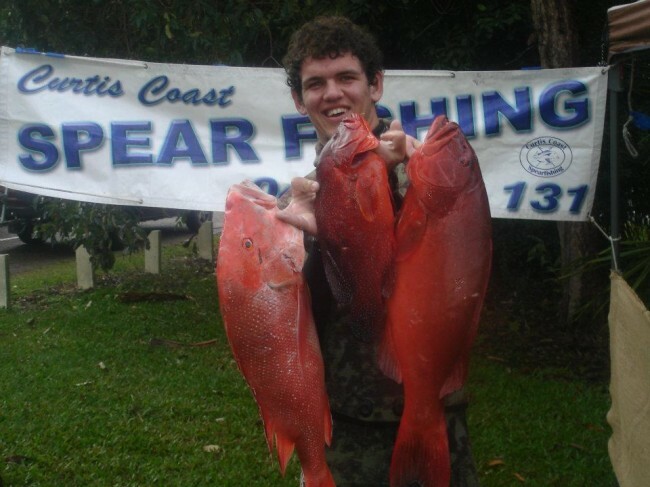 Competitors must carefully consider which fish from the species list to target, shoot and weigh, making this competition a great opportunity to test your selective spearfishing and hunting skills. While I had been looking forward to the competition since last years 1770 Classic, this year just wasn't supposed to happen for me! Our boat and crew departed the boat ramp last on the day, and conditions were reasonably good despite the rainy weather. We were expecting to arrive at the reef by sunrise. Unfortunately, the discovery of a cracked fuel injector 20 miles from the shore prevented this plan from unfolding and it was a long five hour wait, anchored in sloppy ocean swell, for Volunteer Marine Rescue (VMR) to tow us back in. But our boat wasn't the only one with troubles, with a total of four boats, and most of their crew, ending up stranded at 1770 - we blame the Friday the 13th sign-on, but really that's just fishing for you! Holes in hulls, bogged boats and dirty fuel all contributed to the stranding of nearly half of the competitors. Nevertheless, we made the most of our time on land, drinking a few too many beers, sharing stories and footage, and joking about purchasing some fish from the shop to present at the weigh in. Some of the more keen competitors even hopped in for a shore dive around the headland - which can at times produce good fish include Jacks, Spanish, Golden Trevally and Cobia. At 4pm we eagerly wandered down to the boat ramp to find that those who did manage to make it to the reef did extremely well. Spanish Mackerel, Trout, Coral Cod, Red Emperor, Mangrove Jack, Amberjack, Peacock Cod , Corronation Trout, Tuskfish and monster Squid were just a few of the high quality species weighed in. 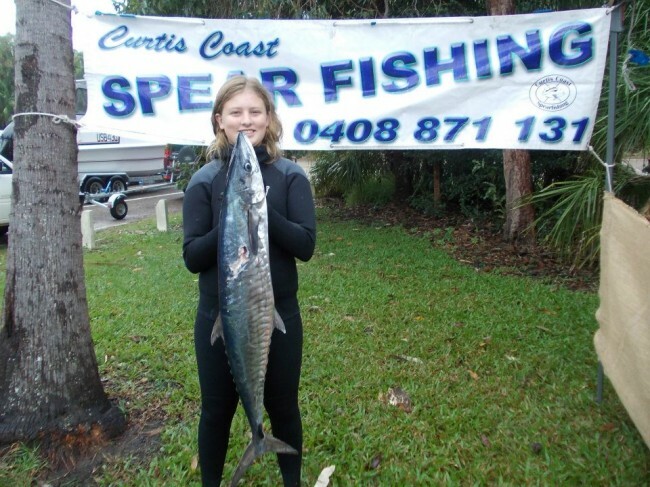 One notable catch included that of 14 year old Michelle Botes, with her almost 9kg QLD womens record Spanish Mackerel. With her Dad, Frans Botes, working the flashers, Michelle was able to dive down and get a great holding shot on her biggest fish yet - no doubt a proud moment for her Dad and the rest of the CCSC club. Michelle placed fifth at another recent CCSC competition, beating some of Gladstone's finest divers, and is definitely a spearo to look out for in the future. It was also great to see the true sportsmanship of the CCSC club - one boat, after having GPS difficulties, found it difficult to navigate their way back to land in the rainy weather. The crew phoned in as soon as they could to explain their dilemma and, despite being 45 minutes late, CCSC still allowed them to weigh their fish in and have their scores count. It's this kind of fairness and sportsmanship from the CCSC club that makes the competition what it is and ensures that a great time is had by all. After cleaning ourselves up we all headed to the pub for presentation where Channel 9 interviewed various divers to do a great news story on the competition. Getting the media involved and getting the right information to them about what it is that we do will go a long way to improving the public image of Spearfishing. We all had our suspicions on who would win the competition, but the great thing is that with such a selective scoresheet and unique scoring system, the competition is really anyones for the taking. This was proven when 19 year old South African spearo, Dandre Kilian, took out the competition with his Red Emperor, Coral Trout and Coral Cod. 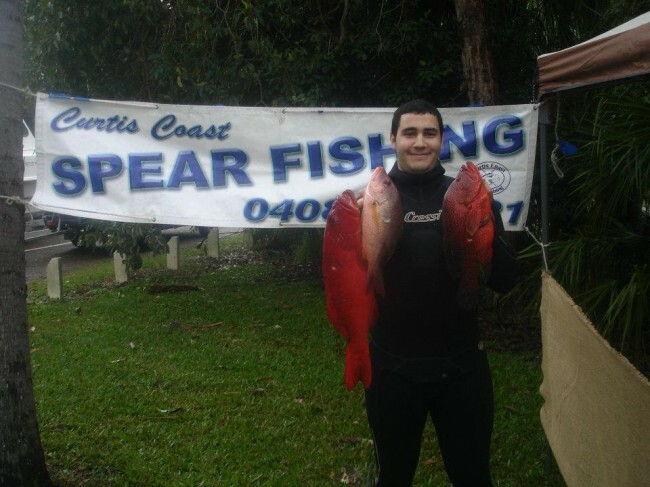 Close behind in second place was spearfishing champion Rob Torelli with his Black Wrasse, Moses Perch and Coral Cod. Dandre took home one of the new Rob Torelli wetsuits as his first place prize. 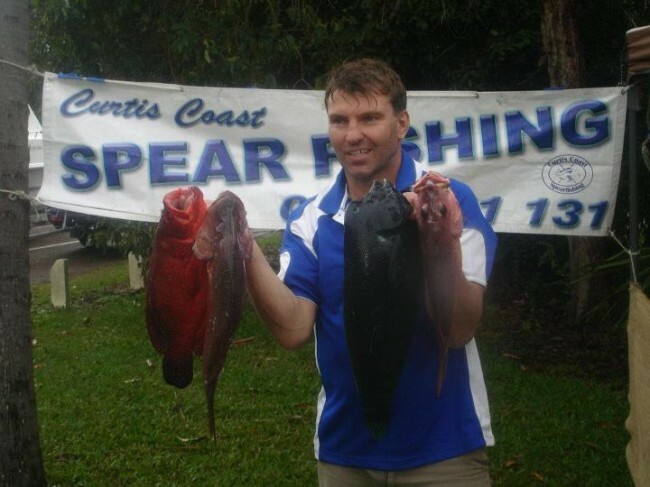 Other categories included the Most Meritorious category which was taken out by a nice Jobfish, and the Logo Hunter category which was won by Ian Brookes who won a pair of Green Immersion fins with his Blackspot Tuskfish, which is the species on the CCSC logo. With the formalities over the typical after-competition antics ensued - a great night out with new friends made and many fun times to be remembered. Despite the hiccups with some boats, the competition was fantastic as always. With its unique scoring system, selective and sustainable ideologies, and enthusiastic management, this annual competition has quickly become one that we will look forward to each year. Keep up the great work, CCSC.